Dental implants are becoming the most sought after dental treatment. It will not be long before they become the most preferred alternative to crowns, bridges, and removable dentures. At Denver Dental Arts we offer two types of implants: single tooth and an implant retained denture. A single tooth implant is a procedure in which an implant is surgically placed into the jawbone and gum where a missing or originally damaged tooth was located. An implant retained denture is a solution for patients who have lost all of their teeth on one or both arches of the mouth. They are dentures that are secured to implants attached directly to the jaw bone. 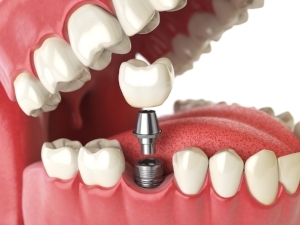 An implant looks like a cylinder or screw and functions as the root of the missing tooth. They are made of titanium or other material that won’t cause an adverse reaction when placed. They offer a number of advantages over traditional treatment. First, they are the most permanent solution since they attach directly to the jawbone. If a patient maintains optimal oral hygiene by twice per day brushing and flossing daily as well as being seen for regular cleanings twice per year, dental implants could last a lifetime. By comparison, a crown or bridge may only last 10-15 years before normal wear and tear require the tooth to be replaced. This also makes dental implants the most cost-effective solution. Dental implants also help to prevent and minimize bone loss. They help to distribute chewing forces to the jaw bones which helps to maintain your bone and facial structure. Without teeth, your bone may resorb resulting in your teeth moving and possible loss of your facial structure. Additionally, dental implants assist in preserving the surrounding teeth. When an implant replaces a missing tooth, the adjacent teeth are not damaged. By comparison, with a conventional bridge, the neighboring teeth must be ground down to support the bridge. Next, dental implants allow you to bite naturally, eat anything you want, and brush normally. They also do not interfere with smiling or speaking. In contrast, removable dentures can affect how you smile and speak, restrict the food choices you’re able to eat, can be uncomfortable or even painful, and need to be removed for cleaning. Furthermore, since dental implants are fixed in place, they won’t move or shift the same way dentures might, saving you from embarrassment and giving you the confidence in your smile that you have always wanted. If you are interested in learning more about how dental implants can not only improve oral health, but also give you the smile you deserve, call our office at 704.951.8272. For the month of August, we are offering free consultations and single implants starting at $1699.